The Wide-Angle Forward Bend or Upavishtha Konasana is a seated forward fold asana directed towards bringing nervous calm and increased range of flexibility in the hips and legs. The posture features in basic-level series of almost all styles of yoga. One of the most doable hip openers for beginner yogis, the pose is also valuable for a nice long stretch in the hamstrings, calves, shoulders, and spine. 1. Sit strong and upright in the Staff Pose. Tilt back upon your hands to the back and yank open your legs to a 90 degree. Keeping support on your hands to the floor, move your buttocks to the front, all the way widening up your legs. Propping up the buttocks with a blanket for soft support is always welcome. 2. Direct your knee to the ceiling and rotate the inner calves to the outside. Determine this by pressing your thighs with some exerted force against the floor. Press down more with the balls of your feet, reach outwardly through your front-up heels. 3. Make your hands walk to the front, approximately 5 steps by bending over only but a slight to the front. Even now there should be force in your thigh bones being pressed against the floor, the kneecaps popped ceiling-wards and your heels thrust heavily, one at each side. Here, one thing to be cautious about is bending from the front torso and not from the waist. You need to stop and realign the bend from the naval-pubis midline, if the bend is happening at the waist. 4. Feel a the tight stretch spreading through the back of your legs the more you fold forward. Enjoy the crisp tension and exhale as the bend forward happens. Stay at the point for a whole minute. Heave your torso up from the bend position with a deep, calming inhale. Folding to go For the Big Toes: Advancing your fold and stretch further, bend forward in your upavishta konasana aiming for the big toes to the left and right. Those with more cultured flexibility level can easily achieve and then must follow by interlocking the fingers around toes and pull them to your torso gently as you lean. Create a counter force to the pull of your toes towards the torso by pushing through the toe base. This is a smart way to intensify the effect and make ankles strong. If you achieve in bringing your torso all the way down to the floor without bending at the waist but rather on the upper body, keep your elbows bent to the sides and lift them just when your torso makes the touchdown. You will get more upper body buoyancy instantly! Optimal Leg Stretch and Relief from Restless Leg Syndrome: The Willis-Ekbom disease, also known as the restless leg syndrome is a source for greatly uncomfortable sensations felt in the legs and feet. It may start with a little impact but gradually gives birth to overpowering tingling, crawling, creeping sensations that make you want to keep moving your legs. While there is an extensive range of invasive medication for the treatment of RLS, there is none as sustainable as yoga. Upavistha konasana benefits this syndrome by availing a sweet stretch in the limbs, causing blood to reach all the nervous nodal openings and thus make neural transmissions from the legs better. Also, the mindfulness attitude of yoga helps you center your psychical acumen and move past the false nervous triggers. Toning and Stimulation of Abdominals: Like all forward bends, upavistha konasana makes pressure impact on the abdominal sphere. The liver and pancreas are softly nudged and prodded, the gall bladders stimulated and the stomach set in a churn. Resultantly, you have normalized bowel movements, enhanced digestive juice flowing, and better metabolism. This pose is highly recommended for constipation, hindered gas release or flatulence, sporadic lower abdomen pain, and menstrual abnormalities. Spine Strengthening with Vertebral Movement: The wide seated forward bend employs a great degree of flexion spinal movement, building more fortitude in the vertebral columns and also for unwinding a stiff back after long hours of doing your desk job. Flexion is a movement which typically lowers the spine with a fold forward to the legs and as a result, elongates the posterior chain. Besides unwinding and de-stressing the lower back, the continual practice of the posture also guarantees great flexibility in the back body. Core Muscle Activation: For those who haven’t gotten the time to hit the gym twice a day, this posture is a relief. Building strength through the belly, side-line waist, glutes, and back, this posture makes core strength flourish. You only need to intensify the practice with deeper, more thorough breathing, and maybe pick up some pace in the intensive vinyasa style too, and you are all set to pump some serious force into your core! Upavistha Konasana benefits will not apply and might mean more harm if you have an injury in the hamstrings or an uncomfortable pull or tear felt in the groins. Herniated disc, injured lower back, and pregnancy are other strict no-no conditions for the pose. 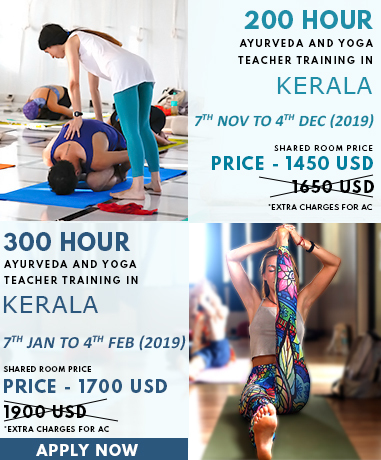 To know more about Upavishtha Konasana in further details, explore our Yoga Teacher Training In India.